The Oregon Small Woodlands Association’s Patron Program offers individuals, companies and organizations an opportunity to provide valuable support for the mission, programs and activities of the Oregon Small Woodlands Association. Family woodland owners are vital to the success of a healthy forest environment and a profitable forest products sector. 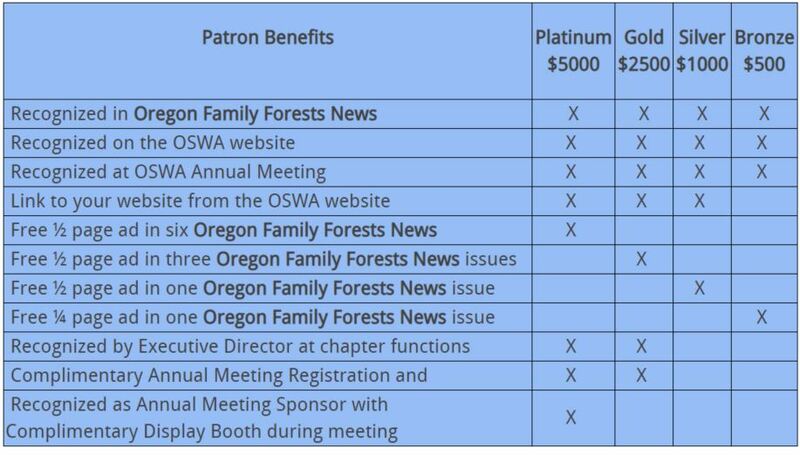 Becoming an Oregon Small Woodland Association (OSWA) Patron is an opportunity to support OSWA and the work it does to represent family forest owners and their partners. Patrons provide critical financial support to the Oregon Small Woodlands Association. Patrons receive benefits dependent upon their Patron level: Platinum, Gold, Silver or Bronze.